All transactions are safe and secure with a reliable history in online purchasing behind each of our associates. 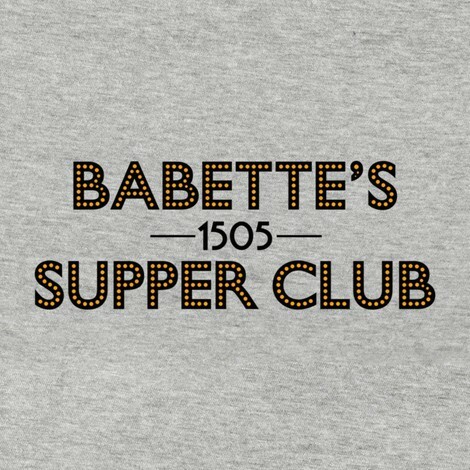 Buy the Babette's Supper Club t-shirt to own Boardwalk Empire clothing and merchandise. Babette's Supper Club is the elite's playground with flappers flouncing around everywhere and secret meeting rooms for big pocket politicians. Here the rules don't apply and liquor flows like waterfalls as if prohibition never existed. It was every man's dream come true and so is this Babette's Supper Club t-shirt. It is available in men's and women's styles so anyone who wants to partake in the festivities can. Don't miss other great Boardwalk Empire merchandise like Fralinger's posters and the Nelson Johnson book. In addition to the Babette's Supper Club tee above, browse the Boardwalk Empire Clothing Gallery for more apparel like men's and women's clothes, kids shirts or hoodies.